"What is the state of my soul before God?" In a day when life is lived for the moment and eternity is rarely considered, many never give serious thought to such a vital question. Here to help you reflect is a godly minister with a true concern for souls. He will sober you. He will challenge you. He will spur you as a sinner to seek salvation by faith in Jesus Christ and as a saint to walk in the way of joyful, obedient service. 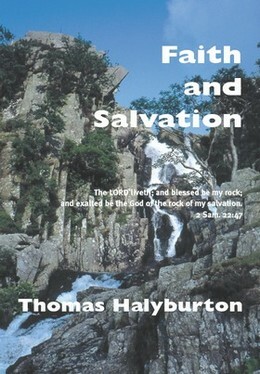 For your lasting benefit read Halyburton on Faith and Salvation. This volume contains Halyburton's work, "The Great Concern of Salvation." T HOMAS HALYBURTON, one of Scotland’s greatest theologians, was first and foremost a preacher of the gospel and as a theologian he spoke from the heart. In this second volume of his Works we meet Halyburton, preacher and theologian. It consists of a series of sermons under the title, The Great Concern of Salvation. Considering that Halyburton lived some three hundred years ago, it is striking to see how directly and plainly he speaks to us today. Even allowing for his divisions and sub-divisions, his style is lucid and cogent. There is a warmth and passion and intense earnestness in every sentence. His use of Scripture is impressive and effective. He is exhaustive in his treatment of Scripture, but never tiring; faithful in application, but never offensive. Indeed his concern for the spiritual well-being of his hearers is evident in his every word. The introductory sermon, on Acts 10:29, "I ask therefore for what intent ye have sent for me?" considers the designs and motives of a people when they issue a call to a gospel minister. It is a masterly treatment of the subject, showing the implications of such action for preacher and people alike. On reading it, one cannot help wondering what are the principles that motivate congregations today when seeking a suitable pastor. Would that they could study this sermon on such occasions, for it is firmly grounded on biblical teaching. When Halyburton turns to a consideration of man's natural state, and conviction of sin, (Rom. 3:23), he puts many heart-searching questions. No stone is left unturned. His exposure of man's sinfulness and peril is devastating. There is just no escape for the sinner when we read these pages. It would be hard to imagine a more faithful and powerful exposition of this key text. In its presentation and application it cannot be surpassed: every conceivable aspect of the text is explored in depth. In this work there is a nice balance between law and gospel. We see that when we compare the sermons on Romans 3:23 and Acts 16:29-31. It is well worth having the book for this latter chapter alone. It should be read and re-read. We are shown the marks of the person who is truly convicted of sin by the Holy Spirit. "One that is soundly convinced of sin, and is thence induced to lay salvation to heart, will not stop at anything he meets with in his way: for he can see no lion in the way that is so terrible as that wrath of God he sees pursuing him; nor can he hear of any enjoyment, to make him turn back again, that is so valuable as that salvation he seeks after" (p. 153). The free offer of Christ in the gospel is stressed. There is no hint of hyper-Calvinism in Halyburton's writings. And he presents the gospel in the context of the Covenant of Grace, salvation being consistently seen in a covenant setting. Superficial professions of faith are exposed. Emotional response alone is insufficient. Knowledge, while essential, is not enough in itself. "Men.....may have their head full of notions of truth, and be perfectly void of saving grace; like the toad, which has a precious stone in its head, and yet has its body full of poison" (p.255). In his treatment of Joshua 24:15, Halyburton shows the Christian's duty with respect to both personal and family religion. In great detail he discusses every aspect of family life – worship, authority, baptismal vows; and family irreligion is condemned. This is an area sadly neglected is much preaching today; consequently many Christian homes are seriously impoverished, and the long-term consequences of such neglect are incalculable. One cannot but be moved, in reading this timely material, by Halyburton’s earnest beseeching of the ungodly to look to Christ for salvation. There is nothing in Calvinism, properly understood, to inhibit such entreaty. Indeed it will do much to prompt and sustain it. In Halyburton we have gospel preaching at its best, as a Spirit-filled man, in a brief span of years, proclaimed the whole counsel of God without fear or favour. His one over-riding desire was to see God glorified in the salvation of the lost and the edification of believers. We live in a day when even in Reformed churches much preaching is shallow and skimpy. And we see, too, the extremes of intellectualism on the one hand, lacking in devotion; and on the other hand an untheological devotion: both extremes are to be avoided. Thomas Halyburton was no theorist. In his early days he had battles with doubts and unbelief. At that time the deistic heresy was having its deadening effect. But Halyburton, by God's grace, finally and effectively rejected deism and made the Reformed Faith his own. So he writes and speaks from the heart. He died at the early age of 38, leaving to the church a spiritual legacy in line with the best of British Puritanism. The structure of his work is almost architectural, it is so systematic. But within that structure we have a wealth of biblical doctrine, and a balance which is quite remarkable. He avoids the extremes that often mar otherwise useful material. This has been well demonstrated by Dr John Macleod in his Scottish Theology. For example, when it comes to the order of salvation, Abraham Kuyper gives priority to justification, whereas Halyburton gives it to regeneration. In this he is right. As Macleod puts it, "In the Reformed Theology, faith is the effect and not the cause of Regeneration" (Scottish Theology, p.128). This second volume of Halyburton's Works is to be welcomed. We look forward to seeing the four-volume series in print. We are much indebted to the James Begg Society for this enterprise which can only be of immense benefit to the church at large. – Rev. Professor F. S. Leahy, Lisburn, 2002.